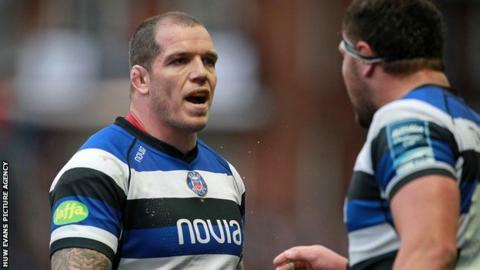 Wales prop Paul James will rejoin Ospreys next season after signing a two-year deal from English Premiership side Bath. James, 32, made 180 appearances during his first nine-year stint with the region before leaving for the Rec in 2012. The loose-head has played 59 games over three seasons for Bath but is happy to return to the Liberty Stadium in 2015. "It's great to be coming home next year," said James. "I'm coming back as a better player thanks to the different experiences I've had over the last couple of years. "A lot has changed at the Ospreys since I was last part of the set-up, but the team has started the season well and have impressed me. "I've had a great few years at Bath. The club has been great to me so I want to finish on a high there this season, before I head home for the next chapter." The prop, capped 55 times by Wales, made his Ospreys debut in the region's first-ever competitive fixture, against Ulster in 2003. James went on to win four Celtic League titles with Ospreys and is fifth in the region's all-time appearance list. He also captained the side which beat Australia in 2006, while his last appearance for Ospreys came in the 2012 Pro12 final win over Leinster. James, who can also play tight-head, now hopes to pass on his experience to the young players at the Liberty Stadium. "There are some really exciting front-row players coming through the system who I'm looking forward to working with," he said. "Playing and training alongside them will also help me as well. "Hopefully I'll be able to play a big part at the region going forward." Ospreys lost a number of Welsh internationals during the summer, with Adam Jones, Richard Hibbard, Ian Evans and Matthew Morgan departing the Liberty Stadium. But Andrew Hore, chief executive at Ospreys, says the new Rugby Services Agreement and money from the European Champions Cup are now making a difference. "Circumstances dictated that we have lost players over the last few years that we didn't want to release," he said. "[But] we have always said that when the business was on a more stable footing we would look to bring selected personnel back to the region. This is exactly what we have done with Paul." "The next challenge is to look to secure the future of the young players that we have here at the region. "We want to ensure that we don't go back to a situation where we have to release players for financial reasons rather than rugby ones."